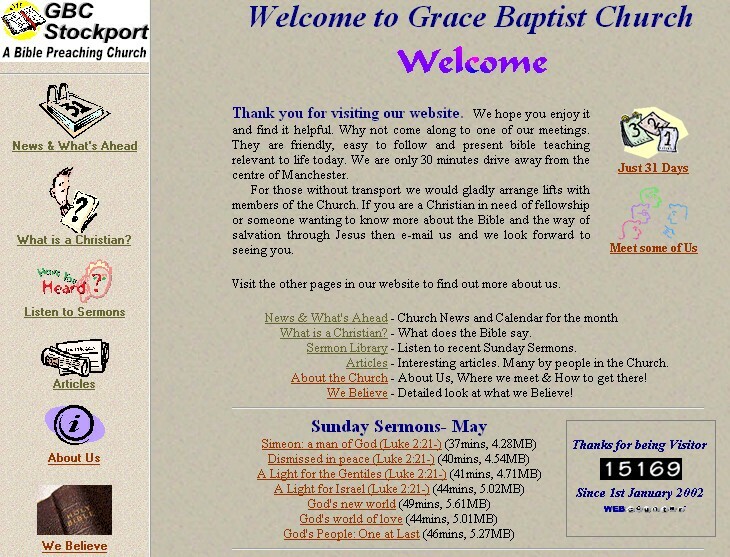 Since 2001 Grace Baptist Church has had a website but the time has come for a change!! Over the years we have been surprised, encouraged and grateful to God for the number of people who have found the site helpful. Whether it has been listing to the sermons, reading the articles or just finding out who we are and where we meet we have much to thank God for. So what has this new site to offer? More sermons – listen on-line, download High Quality or Lower Quality versions, download the complete series. More articles in time. Easier navigation. Better searching and much more. Any problems then let us know, accept our apologies and use the Original website www.gbcstockport.org.uk/classic in the short term. Wishing you all God’s richest blessing in Christ Jesus our Lord from the members of Grace Baptist Church. « 150 Years On – was Darwin right?